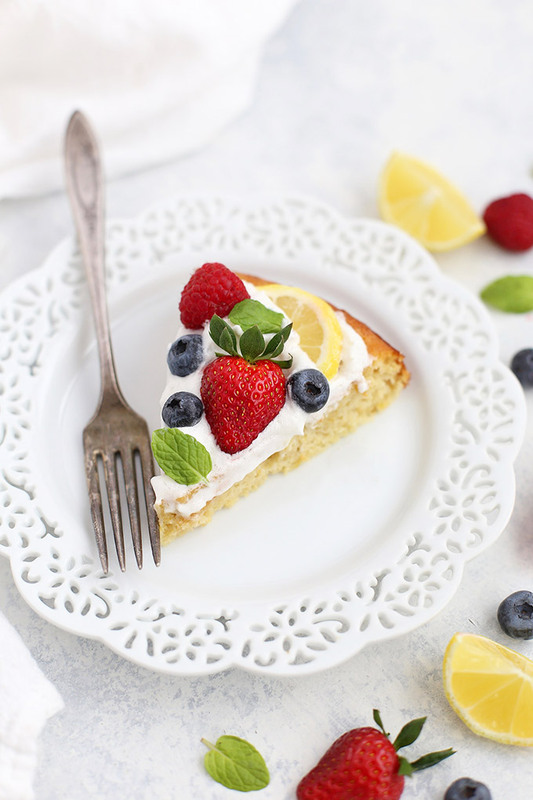 Almond Flour Lemon Cake – This light, fluffy lemon cake is perfect with fresh berries and whipped coconut cream. It’s gluten free, grain free, dairy free, paleo perfection! I *may* or may not have THREE lemon cake recipes on my blog at this very moment. 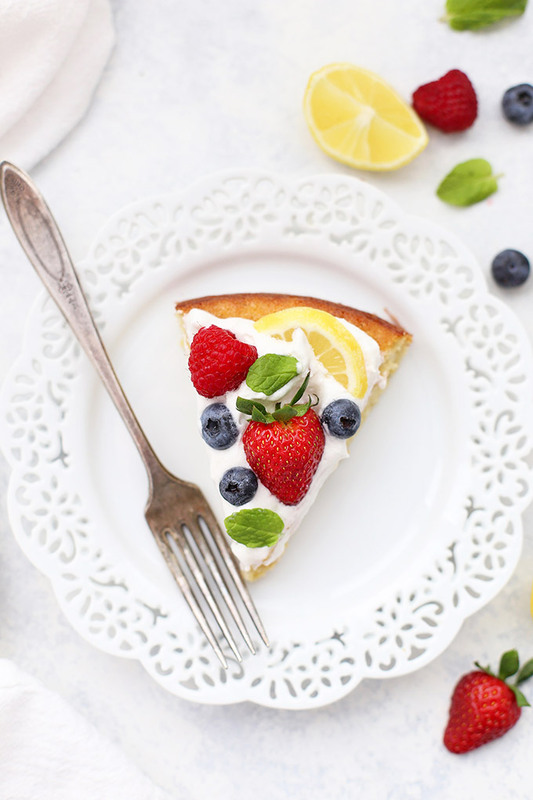 A bright, sunny lemon cake is exactly what spring and summer call for. You KNOW I love a good, dense flourless chocolate cake, or a rich chocolate tart, or a mind-blowing brownie any time. I’m a chocolate lover forever. But there is nothing like the light, citrusy goodness of a lemon cake. They’re sweet and tangy and feel so light and fresh. I don’t blame him. 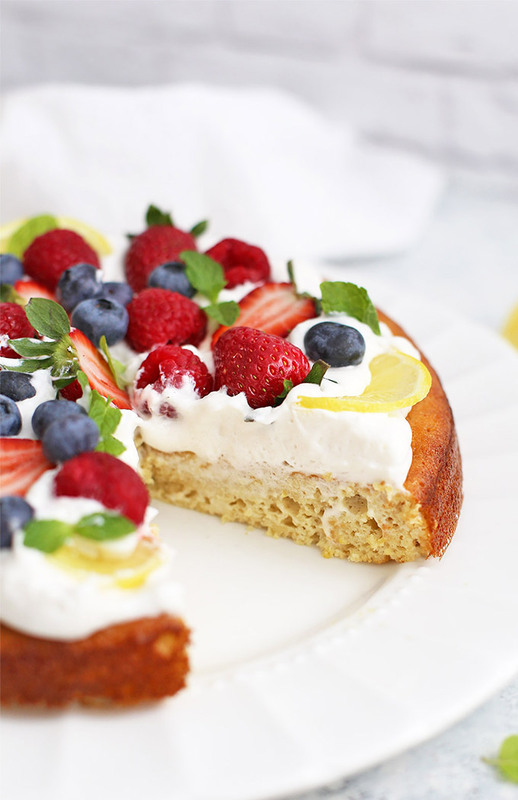 This almond flour lemon cake is perfection. For one thing, you separate the egg whites and yolks. Whipping your egg whites is totally responsible for the “fluff” factor in a cake that could otherwise be quite dense. It MAKES the texture and is definitely worth doing well. I’ve got lots of tips below, so don’t fret if you’ve never done it before. Thirdly, brushing the fresh-from-the-oven cake with a lemon-honey glaze adds and extra lemony layer to this cake and does something magical to the surface. It stays fairly glossy and sort of caramelizes the edges of the cake. Then, the lemon and honey soaks down ever so slightly into the cake, which keeps it from going dry (though it’s certainly not soggy!). 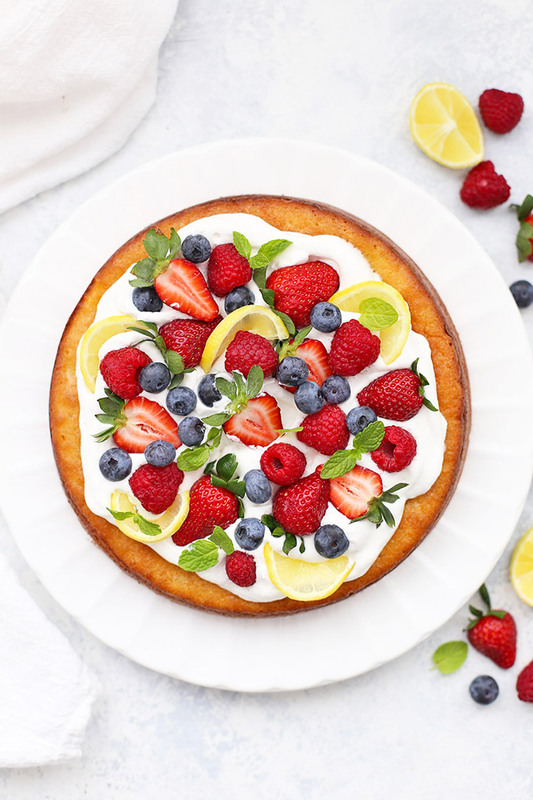 With a few simple techniques, and a lineup of really simple, yet quality ingredients, this almond flour lemon cake is worthy of an Easter brunch, birthday party, summer cookout, or Sunday afternoon. It’s definitely on our short list of favorite desserts! Watch Me Whip-Whip. Whipping the egg whites is KEY here to creating the structure you’re looking for in the cake. The the original recipe, Elise used vinegar and sugar to help stabilize her egg whites. Since I’m using honey instead of sugar in my version, I used cream of tartar. It’s gluten free, dairy free, grain free, etc. and only contains tartaric acid. It’s excellent for adding stabilization to egg whites, and many paleo bakers use it in tandem with baking soda as a substitute for baking powder. I think it’s worth keeping on hand, if only for this recipe. Let’s talk flour. It wouldn’t be almond flour lemon cake without almond flour! I use blanched almond flour for this recipe, which is a finely ground almond flour made from almonds with their skins removed. This is visually and texturally important, so please don’t try to substitute almond meal (which keeps skins on and is coarser). Different brands vary a bit, but I look for “finely ground, blanched almond flour.” I’ve had good luck with Honeyville, Blue Diamond, Hughson Nut, Bob’s Red Mill, and Kirkland brand, all of which I’ve been able to find at Costco at different times, where it’s 3 pounds for $10-12 instead of 1 pound at the grocery store for $8-9. Use what you like, and what you can find! NOTE: You CANNOT substitute ANY other flours for almond flour in this recipe, especially coconut flour. The ratios aren’t the same. Not into whipped cream? Try this! Two words: Raspberry Sauce. It makes everything better, from cake to your morning oatmeal. My favorite recipe (seen here) is about as easy as can be: frozen or fresh raspberries + lemon juice + honey. Puree, strain, and serve. Bam. Preheat oven to 325 degrees F. Line a 9-inch springform pan with parchment and spray with nonstick spray. Separate egg yolks and whites and place in two separate, VERY clean metal or glass bowls. (Egg whites will not whip if there is any grease in your bowl and they need the friction of metal or glass to whip well). To the yolks mixture, add honey, lemon zest, and vanilla. Stir well until smooth. Set aside. In a separate bowl, whisk together almond flour and baking powder. Stir into yolks mixture. (Mixture will be quite thick). Using a hand mixer (or a whisk and a lot of elbow grease! ), whip egg whites on medium speed until just frothy. Pause and add a pinch of salt and the cream of tartar. Continue to whip, now on high speed, until they reach the soft peaks stage. There should be no more liquid egg whites on the bottom of the bowl, and when the beaters are lifted out of the egg whites, the peaks should flop over slightly (instead of standing straight up). Working in 3-4 batches, gently fold the whipped egg whites into the cake batter. At first, this will seem like it might not work. Just keep going, gently using a spatula to fold the mixture together (don’t stir quickly or you’ll deflate the batter). Repeat with remaining whipped egg whites until all are incorporated into the batter. Batter will be lighter in color and very fluffy. Pour batter into your prepared pan and gently shake to even out the surface. Bake at 325 degrees F for 25-30 minutes, or until a toothpick inserted in the center comes out clean. In a small bowl or saucepan, whisk together honey and lemon juice until very smooth and well blended. When the cake is done, remove it from the oven and place on a cooling rack. 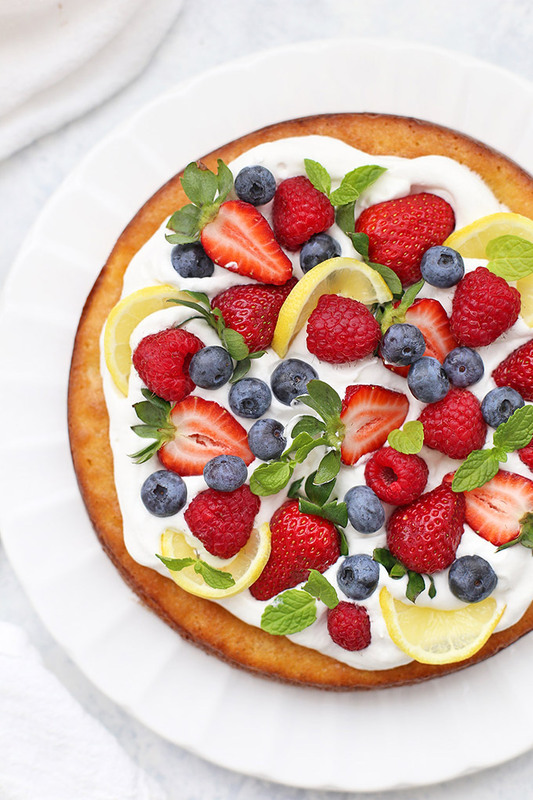 Remove the springform, and while the cake still quite warm, brush with the lemon-honey glaze. 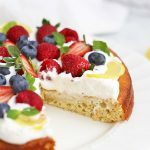 Allow cake to completely cool before slicing, or topping with any garnishes–I prefer whipped coconut cream and fresh berries. *If you are strictly paleo, you can substitute 2/3 tsp cream of tartar and 1/3 tsp baking soda for the 1 tsp of baking powder. « Five Fact Friday – Dancing, Dates, and Our Very Own Easter Bunny! Your gluten free lemon cake recipe is the number 1 cake recipe in our house! So excited to see this new recipe! Can’t wait to try it!! Oh happy day! That makes me SO happy!!! This cake is so beautiful! You can never have too many lemon anything recipes. This will be so great to serve at Easter. I TOTALLY agree. Lemon forever! Can you tell me how many servings according to the calories listed for 1 piece? Sure! It’s 1/8 th of the cake, so 8 servings. They’re nice, big portions! You can cut it into 12ths for smaller servings, if you like! I’ve used almond flour before, and my family wasn’t crazy about the flavor. It could have been the recipe, but I’m not sure. Would you recommend using a mix of coconut flour and almond flour, or just sticking with the almond flour? Jaime – Great question! I’d recommend sticking with the almond flour. In this recipe, the whipped egg whites make a huge difference in texture, and the lemon flavor really shines over any almond flavor from the almond (at least for my family). Coconut flour is not a direct substitute for almond flour and requires significantly different proportions of ingredients. It absorbs several times its own volume in liquid, so usually coconut flour recipes require more eggs and more liquid ingredients. If you tried to substitute in some coconut flour without adjusting the other ingredients, your cake would likely come out very dry and crumbly. I haven’t tested this recipe using any other flour combination, so I don’t feel comfortable advising you about how you might go about experimenting with it. I hope that helps! Have a great day! Could you make this in a regular cake pan? Yep! For easy removal, I spray the pan with nonstick spray, place an “X” of long strips of parchment paper on the bottom (these will act as handles later), then a circle of parchment over those. Then, you can easily lift it out later. (This helps prevent breaking or sticking, though you could probably get away with flipping it out of the pan and onto a baking sheet if you feel confident doing it that way). Could the cake be made a day or 2 in advance and kept in the fridge? Or would freezing be necessary? Katherine – It can absolutely be made a day ahead and stored in the fridge. I probably wouldn’t make it 2 days ahead unless you put it in the freezer. That will help it stay as fresh as possible! Thanks, I’m planning to try it for easter, since I’ve had to cut out dairy! made this wonderful cake yesterday. It was super soft with a great texture and flavour. it seemed slightly under done in the middle even though I baked it for 30 mins. the sides were nicely browned. Sharmila – Hmm…did you test the center with a toothpick, by chance? If it comes away mostly clean, then the cake is done. If there are still lots of moist crumbs or batter, it’s not quite done. The lemon glaze will help keep the cake moist, so if the edges get a bit more browned, it’s ok! Do you put the coconut cream and berries on just before serving, or can they be done a bit ahead? I am on the SCD diet for Crohn’s and I am not allowed cream of tartar. Is there anything else I could use? I can use baking soda but not powder and no starches. Linda – Great question! The cream of tartar is meant to help stabilize the egg whites. It’s not absolutely critical and I don’t know of any non-starch options you could use as a substitute. I’d probably recommend leaving it out and being sure you get your egg whites to the soft peaks stage. I hope that helps!! That’s great! Thank you so much for taking the time to answer. My pleasure! I hope you love it! Made this for a birthday and was a hit. I made it layered with a lemon curd/coco whip mix and strawberry compote. Then fresh berries on top. My oven must be running hot because I baked at 300 for the second layer and got a better result. That sounds DELICIOUS!!! I’m so glad you enjoyed it!!! Marissa – I’m SO GLAD!!! That just made my day. THANK YOU! This cake was delicious! I made this for my mother’s birthday. She follows more of a Paleo style diet, but she is allergic to coconut. It’s hard to good dessert recipe without coconut flour. Thank you. I’m SO GLAD you guys loved it! It’s just our favorite! This cake was amazing! I made it for my Birthday with whipped cream, berries & meringue cookies! I’m excited to make it again! Have you tried making 2 and filling it? I’m thinking an lemon curd mousse and fresh berries. Thanks for sharing this amazing recepie! YAY! I’m so glad you loved it! I haven’t made it into a layer cake, but I bet it’d be incredible!!! 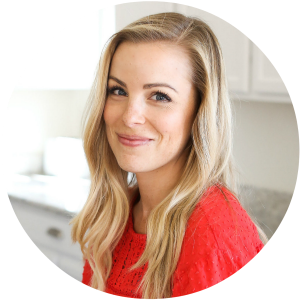 Rhaea – I’m so sorry, I’ve never baked or cooked with stevia before! I’d google a stevia conversion chart. They’re usually pretty helpful! Hi Emily, is there any substitute for the creme of tartar? I dont have it at home. Paula – it’s primarily just to add stabilization to the egg whites. It’s not strictly required, so you could probably skip it if you don’t want to pick some up. Hope that helps! Where do I get the coconut cream? Is it something special, or just the stuff in the can in the international foods section? If I was to make 4 of these cakes and layer them do you think that would work? Thinking of making it for s Birthday. Mari – It would be a very, very tall cake. (This one is at least 2-3 inches tall, so quadrupling it would make for a very high, thick cake.) I’ve never tried slicing layers in half or dividing it among different pans to bake thinner individual layers, but if I wanted to make a layer cake out of it, I’d go that route first. Can you give me (complete novice) some guidance on cooking times and temperatures for thinner layers please. Rob – I haven’t ever cooked this cake in thinner layers, so I’m afraid I don’t have any tested time estimates for you. If I were doing my best guess (dividing the batter between two pans), I’d start by preparing two pans as directed (sprayed or greased and lined with parchment paper). Then, if possible, I’d use a measuring cup to measure equal amounts of batter into the pans. If you have a kitchen scale, you can make them exactly equal by weighing them. If not, just do your best to make them equal. If you’re baking both layers in the oven at the same time, you’ll want to rotate the pans halfway through for even baking. Otherwise, just bake one layer, then repeat with the other layer. As for timing, I’d estimate roughly half the baking time, since the layers would be half as thick. I always recommend checking a few minutes before you think you’ll need to, to prevent over-baking. So, for this recipe, if you’re making 2 thinner layers, I’d start checking the layers at about the 10-12 minute mark, and would guess they’d be completely done by about 12-15 minutes. Again, those are estimates, and the baking times will vary based on the pans you use, and the accuracy of your oven temperature. I’d recommend staying close to the oven so you can keep an eye on them. I HOPE that helps! I wish you the best of luck!!! I just made the cake, and it didn’t rise very much. Will it still taste good? And what did I do wrong? 1. Did you use baking powder or a substitution? 2. Did you use the cream of tartar? 3. Did you whip your egg whites to the soft peak stage? 4. Did you gently fold in the egg whites to the batter, or stir it all in? Sometimes if you beat in or stir in the egg whites mixture instead of folding it, you can squish out all the air bubbles you create when you whip the egg whites. I don’t think I whipped the egg whites long enough. I did fold them gently into the batter though. I made it for my mom for her birthday. It is a flatter cake, but do you think it will taste ok? I can’t cut into it try? Thank you for responding!! I do think it’ll taste just fine! The texture might just be a little less light. 🙂 I hope you all love it! Hi baked yesterday…unfortunately my cake was like Emily’s too…didn’t rise at all and feels very dense. I thought I followed all your instructions – very careful with the egg white folding, etc., The only thing was that I had to use 1/4 of the flour component (almond) with coconut flour. (I ran out of almond flour). Maybe that was it? Who knows. I’m scared to serve at party so off to the bakery I go. Sherri – Not at all! I would definitely think in this case it’s the coconut flour. Coconut flour is NOT a direct substitute for almond flour (or any other kind of flour). It absorbs several times its own volume in liquid, and unless you compensate by reducing the amount of coconut flour and increasing the number of eggs and amount of liquid, the results will not be the same. In this case, it almost certainly absorbed the liquid from the whipped egg whites, etc. and that’s why it ended up dry and dense. Coconut flour cannot be directly substituted for almond flour in any baking recipe without adjusting other ingredients. Hello! Any substitutions for the eggs/whites? We are vegan & typically use flax or chia but not sure if in this cake what you would suggest? Thank you! Faina – The whipped egg whites provide the entire structure of the cake, so you definitely can’t substitute chia or flax eggs in this recipe. (It’ll be far too dense, chewy, and flat). I haven’t tested this myself, but the best suggestion I have would be to use aquafaba, since it’ll provide that whipped, light texture. Two great tutorials I’d recommend for aquafaba:This one from Minimalist Baker and this one from America’s Test Kitchen. Cassandra – My only concern is that the blueberries will add moisture to the cake and might sink to the bottom since the batter is so light. Otherwise, blueberries on top (and maybe even some blueberry syrup!) might be a delicious way to go! Hi Emily, I would like to try this as a double layer cake with lemon curd center, can this recipe be doubled for 2 9” cakes? Tracey – That sounds delicious! I haven’t tried doubling it, but I’d think it’d work! Worst case scenario, you could simply make the recipe twice (so you don’t have to over-beat the batter and accidentally deflate the whipped egg whites). If you give it a try, I’d LOVE to hear how it goes! That lemon curd center sounds like a dream! Hi! This was so good! I really wanted cake tonight and I’m so lucky I found this recipe first. I didn’t have everything on hand so I made 3 substitutions. I used orange zest instead of lemon, 1/4 cup sugar plus 1 Tbsp. water instead of honey, and 1 tsp lemon juice instead of cream of tarter. It didn’t rise as much probably due to the substitutions, but it was moist and delicious. One question: there was a very slight crunch, could it be that my flour wasn’t finely ground? Maybe I can run it through the food processor next time. Thanks for a great GF recipe! Wanted to add…the cake itself was about 1 inch high but still light and fluffy. Lisa – I’m so glad you enjoyed the cake! I’m curious what kind of almond flour did you use? Hi Emily, the carb count looks high is it all from the honey? Could it be substituted with maple syrup? Daniel – I haven’t tried it with maple syrup yet. I think the flavor would conflict a bit with the lemon and it may not go as golden in the oven. If you give it a go, I’d love to know how it goes! I’ve never made them as cupcakes. I don’t think they’d get the “dome” effect you typically look for in cupcakes and since it’s such a moist cake, they might stick to the cupcake liners. If you do give it a try, I’d love to know how they turn out! This sounds so yummy!! I am going to make it this weekend for my mom’s bday dinner! I am allergic to honey, however. Do you know what I sub for the glaze?? Hi- Will this still be a really good tasting cake without any whipped cream? The commercial brand has tons of icky ingredients and the homemade stuff still requires a sweeter other than honey so we would like to skip the whip. Don’t want to bother if the whipped topping is what makes the cake great. Thanks and thanks for having a site that has comments from people who actually made the recipe versus people who feel they need to contribute ‘nummy sounding’ to every recipe generated, as we see on many other sites. Angie – I know what you mean! And YES, this cake will still taste awesome without whipped cream. We like it on its own a lot! I’ve also done it with raspberry puree (just pureed and strained raspberries) and with just fresh berries on top. Hope you love it if you give it a try!